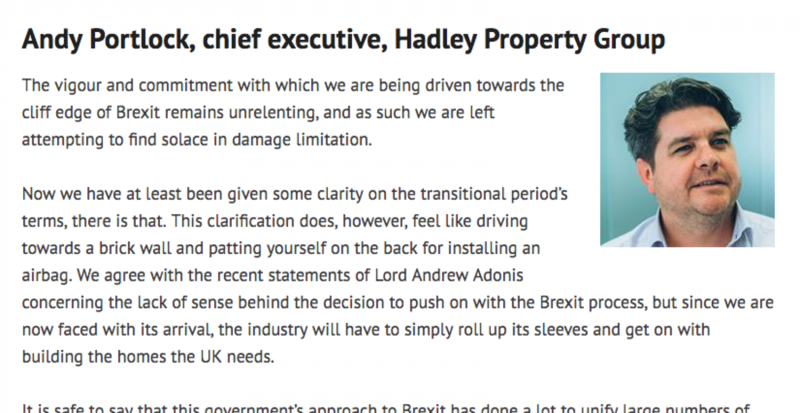 Property Week asked our own Andy Portlock for his thoughts a year from the triggering of Article 50. For those who don't subscribe, here is the text. At last, a little good news – and just a full year into the process. The vigour and commitment with which we are being driven towards the cliff-edge of Brexit remains unrelenting, and as such we are left attempting to find solace in damage limitation. And so this week, when we have at least been given some clarity on the transitional period’s terms, there is that. Our industry has been seeking certainty across a number of issues for the last five years, and so, with at least these terms being agreed, we can now begin to make preparations for the next phase accordingly. This clarification does however feel like driving towards a brick wall and patting yourself on the back for installing an airbag. We agree with the recent statements of Lord Andrew Adonis concerning the lack of sense behind the decision to push on with the Brexit process, but since we are now faced with its impending arrival the industry will have to simply roll its sleeves up and get on with building the homes which the UK so desperately needs. It seems safe to say that this government’s approach to Brexit has done a lot to unify large numbers of London’s residential development community. And so one year on, the question still remains - is there a point which we can arrive at in the not-too-distant future which makes more sense than simply continuing to exist and operate within the framework of the European Union?